My recent trip to Cyprus was a little disappointing. Although I did get to see many hundreds of butterflies they proved remarkably difficult to photograph. For starters it was way hotter than expected, peaking at around 37 degrees. It was clear I’d misjudged the timing by 2 weeks to a month – the majority of the wildflowers were burnt to a crisp. The second problem was the light. Each day I awoke to a beautiful clear blue sky. Now I don’t want to sound ungrateful here, but, bright light makes for a very harsh, contrasty image with dark shadows. And those same shadows followed me around like a black labrador, scaring off all before me. I was soon wishing for just one overcast day for some softer diffused light. The third problem and the real killer was the wind. Whilst the cool breeze was welcome, a butterfly perched on a thin blade of grass or twig might as well have been sitting on a windscreen wiper. 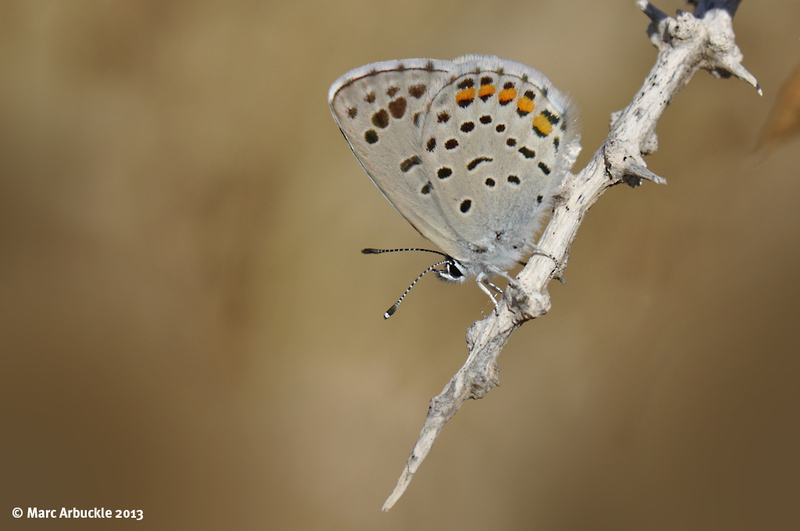 On the positive side I did get to see quite a few new species like the relatively rare Eastern Baton Blue Pseudophilotes vicrama, pictured above, which I found sheltering in the shade of Cape Gkreko. Plus some quite extraordinary large insects including the Oriental Hornet Vespa orientalis and the Mammoth Wasp Megascolia maculata flavifrons both of which needless to say I failed to get a decent photo of. Out of a possible 53 species of butterfly, I saw 18, including 3 that can be found in England but I’ve yet to see. The magnificent Swallowtail Papilio machaon, the Clouded Yellow Colias crocea and the Lulworth Skipper Thymelicus acteon. Guess I’ll have to go back next Spring.